A "significant fire" broke out at the iconic Notre Dame Cathedral in central Paris at 7 pm local time, according to the national police. 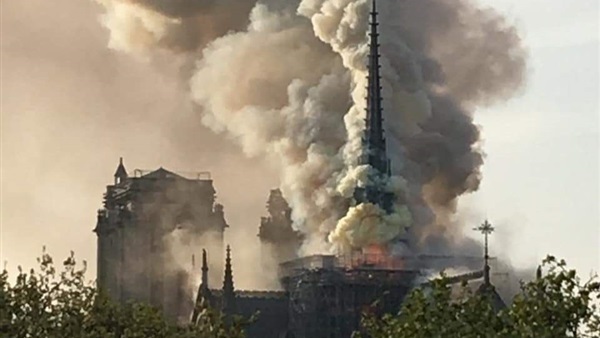 Smoke could be seen billowing out from the top of the medieval cathedral, as flames leapt out beside its two bell towers, a Reuters witness said. Both the spire and roof of the cathedral have now collapsed. No injuries have been reported at this stage, according to French Junior Interior Minister Laurent Nunez. The Paris Prosecutor has opened an official investigation to determine the cause. French President Emmanuel Macron and Prime Minister Edouard Philippe have arrived at the scene along with the Prosecutor. A major operation is underway, the fire department said, while a city hall spokesman said on Twitter that the area was being cleared. "A terrible fire is underway at Notre-Dame Cathedral in Paris," mayor Anne Hidalgo wrote on Twitter. "Firefighters are trying to control the flames ... I invite everyone to respect the security perimeter." Police advised people to avoid the area in a tweet and requested that they facilitate the passage of emergency and vehicles. French President Emmanuel Macron has cancelled a planned 8 pm CEST address to the nation due to the "terrible fire", said an official at the president's Elysee office.